James has a passion for art and anime, and really enjoys working on cartoons and all sorts of animation. Over the last few weeks James has been building a light box to further enhance his animation and story’s. These light boxes are used by some of the first leading artist and cartoonists in history and made notably famous by Walt Disney! 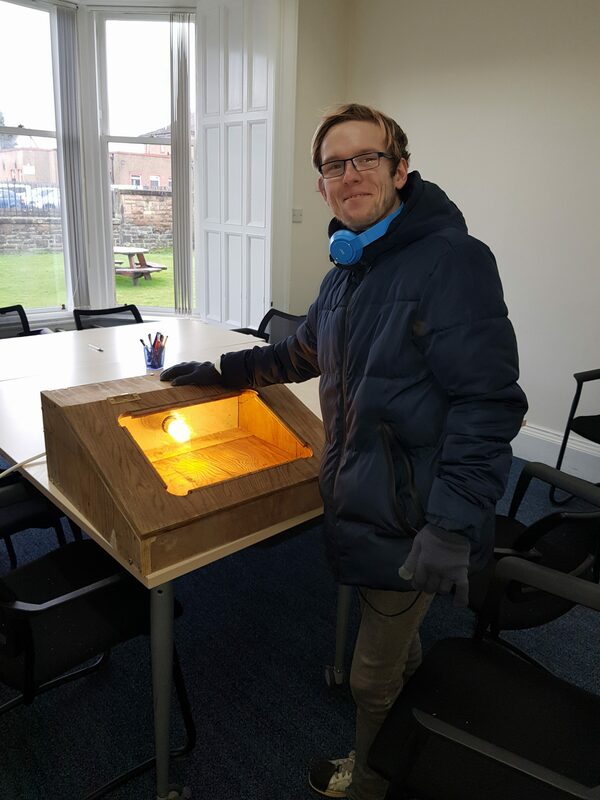 James is Delighted with his creation and all it needs now is a bright bulb and a lock of paint! We’re really looking forward to seeing some of his work in the coming weeks. For some of the people who attend the workshop, it is the highlight of their week. We would like to give a special mention to our volunteer who runs the pallet workshop; Rob Alexander. Rob oversees all projects and really helps to bring out the best in people who attend every session. Without his support and creativity it would be extremely difficult to keep the workshop up and running.